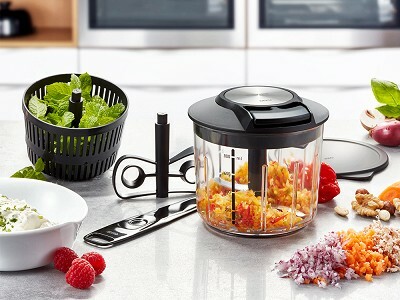 Speedwing's Manual Food Chopper does many of the prep jobs a typical food processor does but it does them without needing any power. It’s scaled way down to take up as little countertop space as possible (and none of the important real estate at the outlet), while still making quick work of chopping, mixing, and spinning. It’s great for small jobs like rinsing fresh herbs, cutting up veggies, or whipping up a dip. A pull-cord gets the chopping blade, mixing insert, or spinning basket into action—and is way more fun to use than just pushing a button. Pop the lid on and you can take the whole thing with you and when you’re done with it, Speedwing cleans up in the dishwasher. What accessories does the chopper come with? 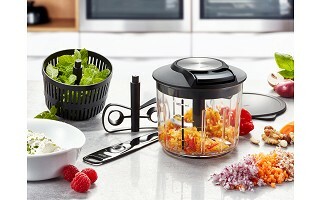 The Manual Food Chopper includes accessories for mixing, spinning, and storing. 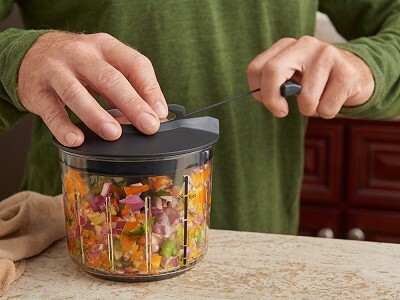 It includes one lid with pull-cord mechanism, one container, one storage lid, one cutting insert with protective blade caps, one stirring insert, one spinning basket, one attachable upward deflector, and one spatula. What is the capacity of the container? The container has an 800 ml (27 oz.) filling volume and a 1000 ml (33.8 oz.) capacity.